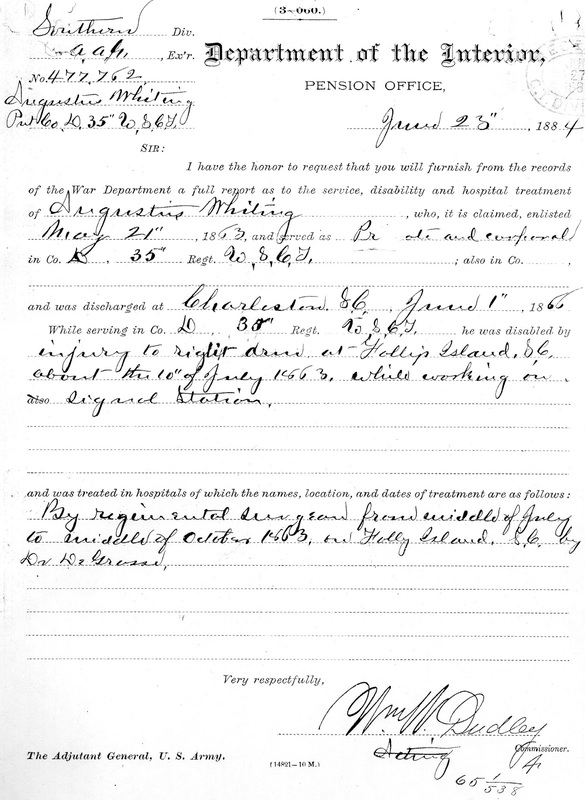 How Did Augustus Whitney Become Injured During The War? 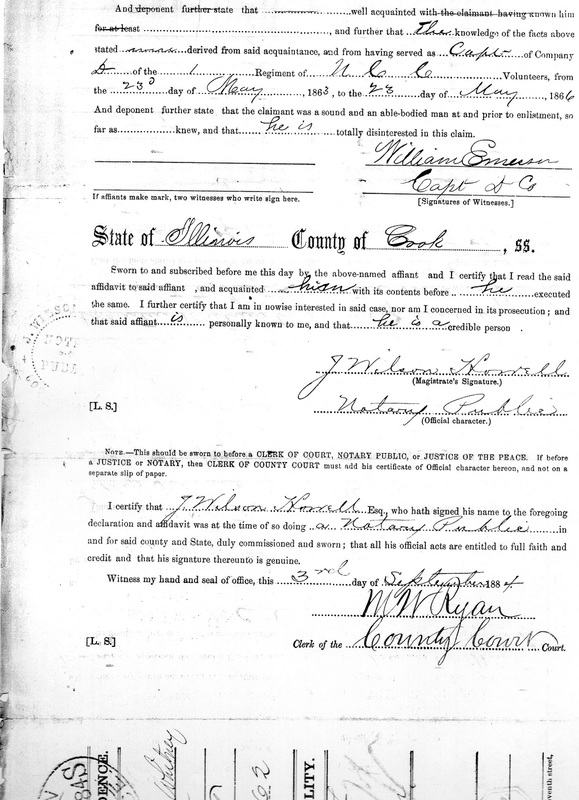 So How did Augustus Whitney, my 2nd great grand uncle get injured during the Civil War? This Department of the Interior Document provides a summary of what happened. 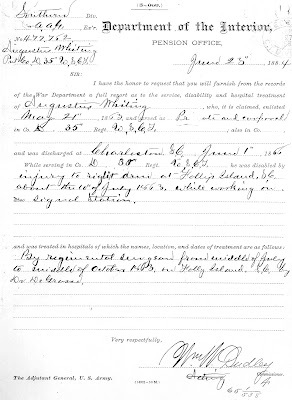 I have the honor to request that you will furnish from the records of the War Department a full report as to the service, disability and hospital treatment of Augustus Whitney, who it is claimed, enlisted May 21, 1863, and served as Private and corporal in Co. D, 35 Regt. 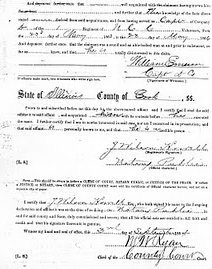 USCT; also in Co. ,___________and was discharged at Charleston, SC June 1, 1866. While serving in Co. D 35 Regt. USCT he was disabled by injury to right arm at Polly's Island, SC about the 10 of July 1863, while working on the signal station. ______________________________and was treated in hospitals of which the names, locations, and dates of treatment are as follows: By regimental surgeon from middle of July to middle of October 1863 on Polly Island, SC by Dr. DeGrasse. So there you have it. It was an injury to right arm. Now for the specifics to the story. That the said Augustus Whitney while in the line of his duty, at or near "Holly's Island" in the State of SC, did, on or about the______day of July, 1863, become disabled in the following manner, viz: While on duty, working on the parapet of fort on Holly's Island fell from parapet of said fort and incurred an injury of elbow of right arm. And he the said Augustus Whitney by reason of said injury was sent to Regt Hospital on said Island. That the facts stated are personally known to the affiant by reason of his being in command of his company at the date of the injury of elbow of right arm. The said Augustus Whitney was absent in Regimental hospital about three months. Applicant complained at times of disability of the right arm and was excused from hard laborious duty in consequence of it. 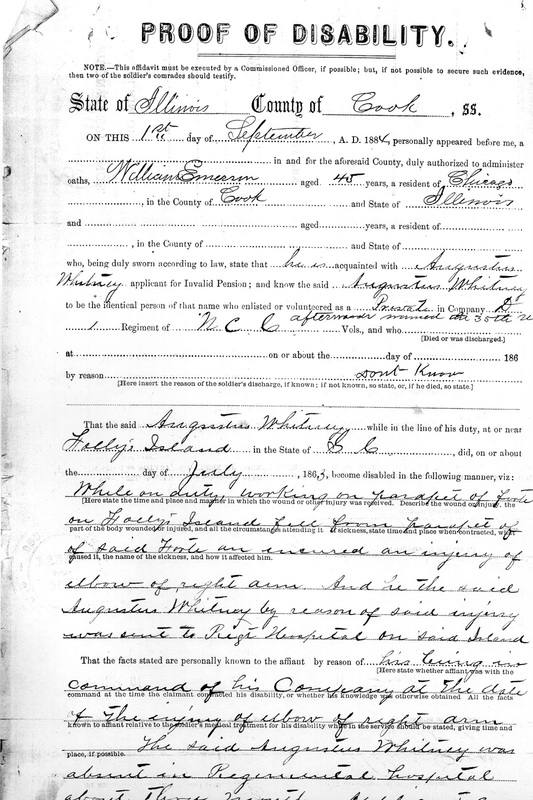 And deponent further state that ________well acquainted with the claimant having known him for at least____________, and further that the knowledge of the facts above stated were derived from said acquaintance, and from having served as Capt of Company D of the 1 Regiment of NCC Volunteers, from the 23rd day of May 1863, to the 23 day of May, 1866 far as _____knew, and that he is totally disinterested in this claim. Sworn to and subscribed before me this day by the above-named affiant and I certify that I read the said affidavit to said affiant, and acquainted him with its contents before he executed the same. I further certify that I am in nowise interested in said case, nor am I concerned in its prosecution; and that said affiant is personally known to me, and that he is a credible person. 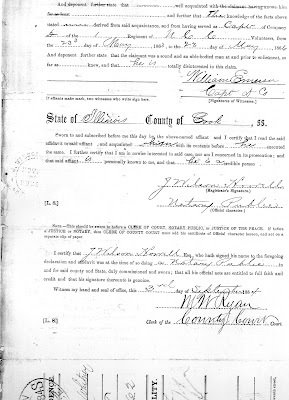 I certify that J Wilson Howell Esq., hath signed his name to the foregoing declaration and affidavit was at the time of so doing a Notary Public in and for said county and State, duly commissioned and sworn; that all his official acts are entitled to full faith and credit and that his signature thereunto is genuine. Witness my hand and seal of office, this 3rd day of September 1884. Clerk of the County Court Court. Now the reference to "Polly's Island" or "Holly's Island" in the documents listed above, I have figured out since to refer to Pawley's Island, SC. Pawley's Island is located approximately 70 miles north of Charleston and 25 miles south of Myrtle Beach.